Texting My Pancreas: A Bad Habit. When my endocrinologist downloads the data from my Dexcom receiver later today during my appointment, she's bound to notice quite a few gaps - like the one last night, where there will be no data from around 11:30 pm until I woke up this morning at 5:45 am. You see, about a half hour before that I had clocked in at 80 mg/dL. 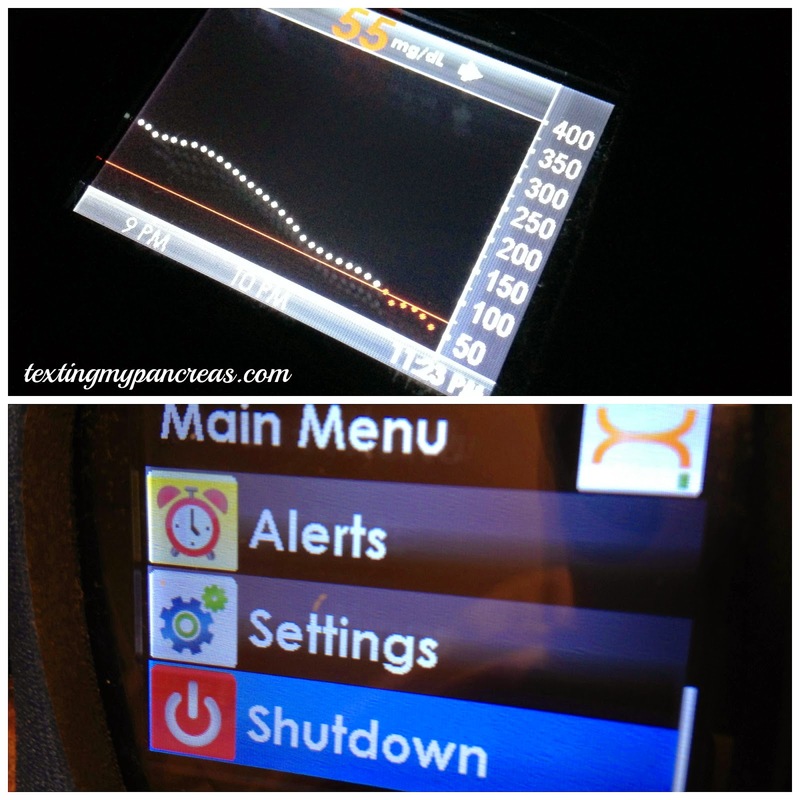 I had no insulin on board and no food in my stomach, as dinner was hours before that. I hadn't gotten much exercise that day or the day before, so I felt reasonably comfortable taking the gamble of doing nothing about a reading that teetered right on the cusp of being "low". Literally the only things I did in the next few minutes were brush my teeth, plug in my phone, and lay down. I tossed and turned though, and couldn't find a comfy position. And when I finally did? Where the hell did that 67 come from? And then the 55? Mild sleepiness transitions to anger: Ugh, GOD, I'm fine, stop freaking out. Again: BZZZ BZZZ BZZZ BZZZ! That's it; I'm done. You're done. Some might say, "TURN DOWN FOR WHAT". Lately, I too often say, "SHUTDOWN FOR SLEEP". It worked out in this instance, but there's never any guarantee - when I turn off my CGM receiver, I'm opting out of a safety net. In theory this shouldn't bother me, as I should be able to use technology in the ways it works for me (and opt out of it when it doesn't), but that all too often comes with a side order of guilt. When I'm forced to decide, "what's more important - sleep or safety? ", all too often the need to sleep has been winning. I had a couple of nights like that in the last month. You've gotta do what works for you. As long as it works for you (I guess that's where the side order of guilt comes in). Sometimes, you just need a good night's sleep. BTW, love the #lowBGiscontextual hashtag. I absolutely do the same thing. My CGM gives me an "alert silence" option, and often when I'm half asleep and not thinking clearly (and just want to be whole asleep??) I will choose to mute my low alarms until morning. In the light of day I always feel it was irresponsible of me, but in the middle of the night I just can't seem to stop myself. Alert Silence is a good name for a Buddhist retreat. But for the sake of your mothers who could be reading this, girls, please (at least pretend to) torque up the volume on any available alarms to 11. Meanwhile, sleep. Yes. You need sleep. You'll make better decisions all through the next day--math, driving, spouse-wrangling. Just please do everything perfectly forever and keep on smiling! my Dkid is 18 months and i JUST started waking up only once a night to check him. sleep is necessary. but i mostly commented to say we just started with the verio snyc this week and i love it! i havent seen too many in the wild though. I do the same thing. When I grow up and become a biotechnologist and learn how to jailbreak my CGM, I'm gonna figure out how to silence the alarms that happen when I'm coming back up (I was just 55, I don't need to know that I'm now 80!?!). Until then, it will be turned off sometimes. "How Are You Managing Your Diabetes"? Joslin Diabetes, Dexcom, and "The Institute".